We are having a Dance Party today! 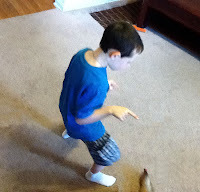 My kids are music kids--they love listening to music and even make up their own songs. My favorite is "A apple, a apple. I'm eating a apple. It's black and yummy". (My son calls red delicious apples black. He sometimes has a hard time distinguishing the darker colors.) So today, the TV and computers are going off and we're turning on the music! After all the dancing, I'm sure we're going to be hungry! Today is National Chip & Dip Day, so we're going to have a snack of chips, salsa, and dip. A favorite at my house is Beer Cheese. It is easy to make and stores for a few days in the fridge. 1. Heat beer and cream cheese over low to medium low heat, until well combined. 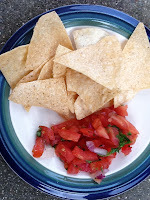 I also love to make my own salsa (I hate store bought). By combining diced tomatoes, green peppers, red onions, cilantro, and lime juice, you have a healthy dip for your chips! Another easy dip is a Taco Dip. 1. Mix seasoning, sour cream, and cream cheese together. 2. Place on bottom of dish (1st layer). 3. Add shredded lettuce (2nd layer). 4. Add diced tomatoes (3rd layer). 5. Add cheese (4th layer).